Does The FLEXISPOT Exercise Desk Bike Blend Work And Fitness Well? 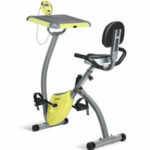 Exercise desk bikes like the FLEXISPOT Exercise Desk Bike are designed as a great hybrid between regular exercise bikes and under desk cycles. 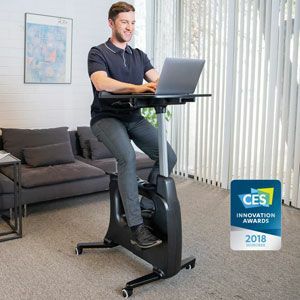 They are meant to provide the convenience of an office-friendly model – thanks to the desk area and shape of the bike – with the added functionality of a gym machine. The idea here is that this machine will help users stay fit and healthy while also allowing them to get on with all their important products. It looks like it should be up to the job, but what do users think of this option? The Pros and Cons of this FLEXISPOT Home Office Desk Bike. 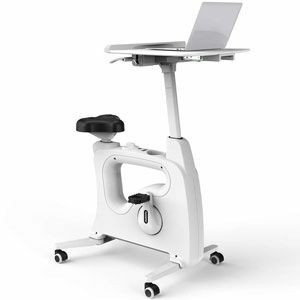 The designers have put plenty of thought into the combination of different features in this FLEXISPOT desk bike. 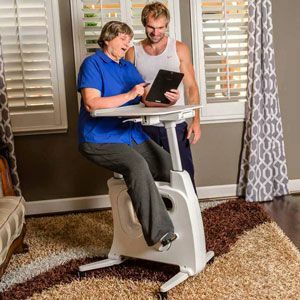 Starting with the exercise bike element, this machine has eight levels of resistance and an adjustable seat for users of different heights. It adjusts from 155cm to 190cm. This, in theory, means that colleagues should be able to use the same space with few worries. The resistance is manually adjusted with a simple dial next to the seat post. The setting appears on the small LCD display, along with basic data on time elapsed, distance and speed. This LCD isn’t very big and isn’t the clearest around. Still, users are happy with the information they get. Other brands may not have bothered at all. In addition to this, the designers of this bike wanted to make sure that it was office-friendly by making it “whisper quiet” and offering a space saving design. Most are happy with these promises, stating that the machine is just the right size and doesn’t make much noise at all. It isn’t as good looking as some of the recumbent desk bikes around, as it is a little boxy. But, that boxy shape means that it fits into small cubicle spaces. It, therefore, shouldn’t get in the way of other people in the office space. The FLEXISPOT Office Desk Exercise Bike still has a few flaws for in both the stationary bike and the desk elements. There are some small issues with this hybrid machine that new buyers need to be aware of. Compromises have to be made with products like this to get the best of both worlds – the exercise and the work environment. As a result, the desktop could be a little bigger and the seat could be more comfortable. It seems that the designers didn’t think about the padding and ergonomics of a bike saddle here. Instead, this is a pretty basic seat that could do with a gel cover after a while. The desktop is just the right size for the bike machine as there is no risk of it overbalancing or getting in the way. But, it does have limitations for those that want to use a mouse and a keyboard. The work area is said to be large enough for a laptop, notebook and phone. It is worth keeping this in mind when deciding if this model is right for you. On a plus side, the desk element is also height adjustable to help users get comfortable. Is this FLEXISPOT Adjustable Exercise Desk Bike still recommendable with all these pros and cons in mind? There are some clear downsides in getting this sort of hybrid model. Those that want a good work out at their desk may not have the features and intensity they need – nor the comfort in the seat. But, they can enjoy a smooth, quiet motion with just enough resistance settings. Those that are keen to work hard as they pedal may not get along with the small dimensions of the desktop. But, this is an adaptable, space-saving machine that still has the potential for improved circulation, mobility and concentration in the workplace. In the end, the final recommendation on this FLEXISPOT exercise bike depends on how much you are willing to sacrifice and how much you like the design. Find more reviews about the FLEXISPOT Exercise Desk Bike on Amazon here.